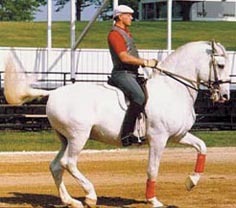 The classically ridden shoulder-in provides the horse with the best foundation for gradually finding the transitions from horizontal balance to moving more on the haunches – or with “collection.” Often considered one of the most difficult movements to execute properly, these three exercise provide a thorough basis for preparing and teaching the horse the shoulder-in. Both simple and advanced patterns are offered. Sorry, there are no refunds on this product. All rights reserved. You may not copy, reproduce, republish, sell or distribute in any way any of the materials on this web site or the downloadable publications without written permission.